EDIT: Since writing this post, I have educated myself on the origins of this practice of smoke cleansing and how to approach it with more integrity and less cultural appropriation. You can learn more here. Ever since I came across a basket of beautiful wildcrafted smoke cleansing bundles in an apothecary in Colorado, I have been dreaming of making another one of my one. And this time, I wanted more color, more length, and more character. I talk a bit about smudge sticks and herb fire starters in this post, but I can give you a brief overview as I know a lot of people are drawn to them but still aren't sure what they are used for. 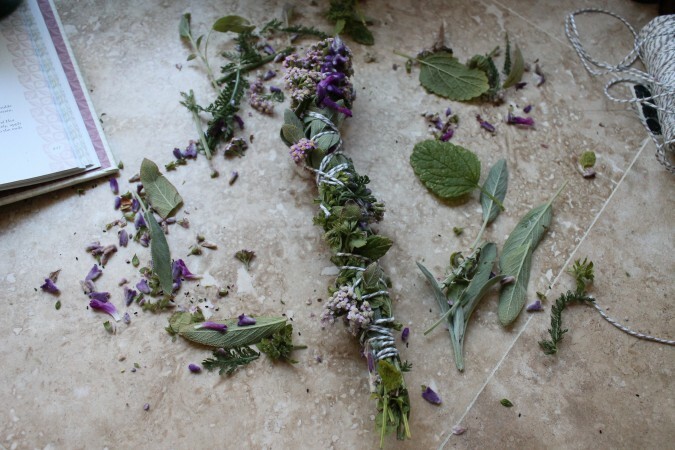 A smoke cleansing bundle is a bundle of dried herbs that can be burned like incense to clear the energy in a space and signify the sacred. I like to use a smoke bundle to symbolize the beginning and end of something - like my moon cycle, a sister circle, or a really crappy day. Sage is the traditionally used herb, but there are many other aromatic herbs you can use as well. You can even look up the plant wisdom and lore for a specific herb if you want to set a specific intention in your space. 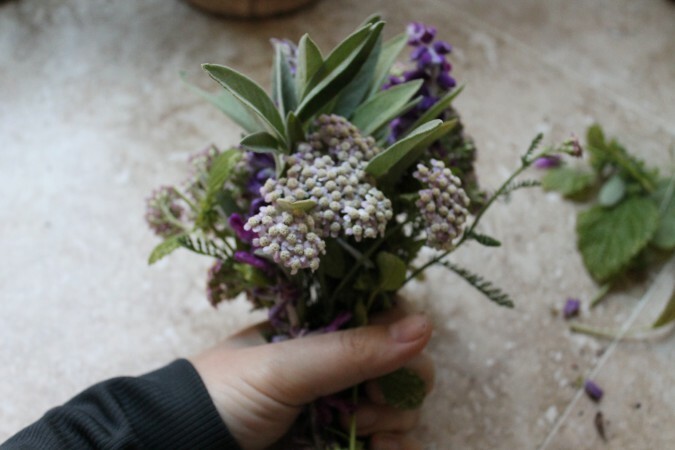 For this bundle, I simply walked out into my garden and gathered herbs that were both aromatic and beautiful. I ended up with sage, lemon balm, spanish lavender, and pink yarrow. The pop of pink and purple really make this wand a beauty, I think. You'll notice it's not perfectly shaped. That is intentional. As a dabblist, I want to show you how much this process is not about doing it "right" and instead about engaging in the senses and experience of creating your wand. Get in there, sister! Harvest your herbs using your scissors, in the morning sun (once the dew has dried) to prevent mold. 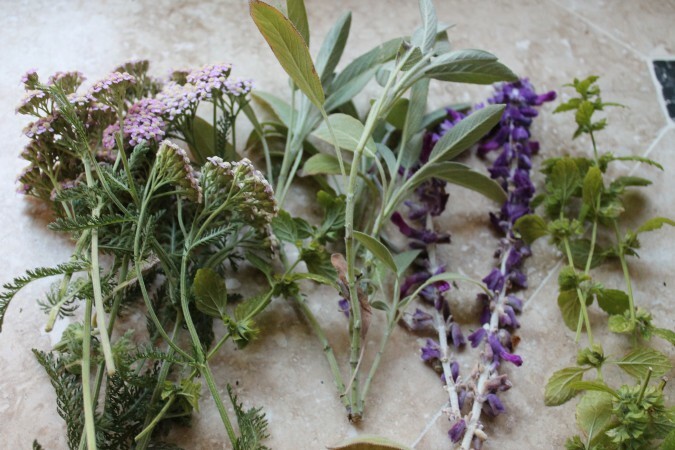 Combine herbs together in any way that feels good to you and secure with your string. Start at the bottom of the bundle, circling the string around for a few times to secure it. Then wind the string on an angle up to the top of the bundle. Turn the bundle around and wind the string back down to the start, creating a criss-cross pattern over the first strings. Keep it in a dry and dark place to allow to completely dry (it will take a few weeks). Once dry, it is ready to light. For your smoke cleansing, you’ll want to hold one end of your stick and light the other with a match. Let the end burn a bit before blowing out and allowing it to smolder so you can begin smudging. When finished, gently pat down the smoldering end of your smudge stick so it goes completely out. To learn more about the ceremonial ways to use a smoke bundle (and how to bless a person using a feather), check out more info here. Me too, suzi, me too. It took me years to actually get into the magic of it because I just didn’t *get it*. Here’s hoping others will dive in! Thank you for this tutorial. 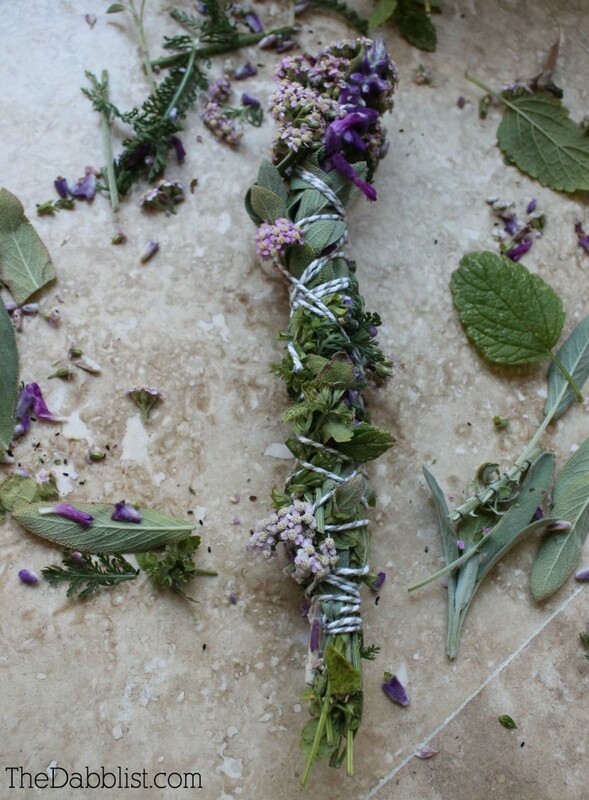 It not only encourages me to make my own aromatic smudge wands, but also gives me ideas on fragrant herbs to plant. ?